This Saturday, local music (and local-ish music) takes over Downtown Dallas again! 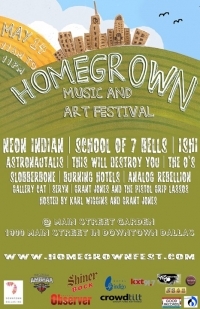 It’s the second annual Homegrown Music and Art Festival. Want to go on the free? The Fest boasts quite the lineup of local talent including some PSD faves: Ishi, The O’s, Burning Hotels, galleryCat and more. Former locals and America’s favorite buzz-band, Neon Indian, headline. Even School of Seven Bells have a local tie (the guitarist is from Dallas). This is sure to be a good time and it all happens this Saturday from 11am-10pm at Main Street Garden in beautiful Downtown Dallas, America. If you want to go for free, just be the first person to email us at contact@pearlsnapdiscount.com. Tell us who you want to see! Tix are only $15 bux if you buy them now through Prekindle. UPDATE: WE HAVE A WINNER. Thanks for playing, dudes. See you at the show!